Yum. That's the best word to describe an order of greasy, salty, piping hot French fries. Delish. But when it comes to vegetables, white potatoes definitely aren't your best friend. And if they're fried they're really doing you no favors: They pile on the calories, unhealthy fat, sodium, and have comparatively few minerals and vitamins. 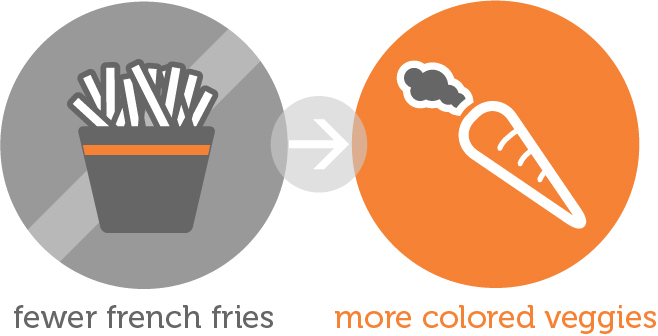 Since life is short and French fries are very, very good, start by simply swapping out one order of fries for a colored veggie as often as you can. For example, if you eat French fries three times a week, choose an order of broccoli, spinach, sweet potatoes, or another non-white vegetable on just one of those days. Try to choose vegetables that aren't cooked in a lot of oil or butter or with a lot of added salt. (Most vegetables are naturally low in fat and calories.) By eating more veggies--the U.S. Department of Agriculture recommends adults get two to three cups of vegetables every day--you'll lower your risk for heart attack, stroke, cancer, obesity, diabetes, and other health problems. You'll also get the fiber and minerals and vitamins your body needs to fuel your exercise.